The Dornier 328 is 30-34 seat turboprop powered commuter airliner designed and engineered by Dornier in Oberpfaffenhofen, Germany. Development of the 328 started in 1985, after Dornier decided to redesign the fuselage of the Dornier 228. After Dornier's market research had indicated a substantial market for regional airliners in the 30-seat class it was decided to develop the Dornier 328. Work began in December 1988, culminating in the first development aircraft's rollout on 13 October 1991 and the first flight on 6 December 1991. The 328 was awarded EJAA certification on 15 October 1993. First customer deliveries occurred on 21 October 1993, when the Dornier 328-110 s/n 3005 HB-AEE was handed over to the Swiss scheduled carrier Air Engiadina. The initial 328-100 was followed by the production standard 328-110 with redesigned aerodynamics and increased performance. Other models are the 328-120 with improved short field performance and the 328-130 with progressive rudder authority reduction with increasing airspeed. In June 1996 Fairchild Aerospace acquired 80% of Dornier to form Fairchild-Dornier GmbH, but production of the 328 had stopped already before the Fairchild Dornier name became effective on 8 August 2000. In 2002, Fairchild Dornier filed bankruptcy and the court appointed administrator determined that the company had to be sold in pieces. The US company AvCraft Aviation acquired the Fairchild-Dornier’s 328 program, including the 328 production line at Oberpfaffenhofen, Germany. Early 2005 AvCraft Aerospace GmbH, the German subsidiary of AvCraft Aviation was declared insolvent at a German court at Weilsheim. In December 2005, UK’s Corporate Jet Services Ltd purchased the former AvCraft Aerospace GmbH. On 2 January 2006, Corporate Jet Services Ltd created the German subsidiary '328 Support Services GmbH', headquartered at Oberpfaffenhofen near Munich. It holds the type certificate of the Dornier 328 Jet and Turboprop aircraft plus the Dornier 428, and is carrying on the worldwide support of the aircraft. Part of the company’s strategy was to work towards returning to service the Dornier 328 aircraft which were parked in Europa and US.In February 2015, 328 Support Services GmbH itself was acquired by the US engineering company Sierra Nevada Corporation. Shortly thereafter, Seirra Nevada's owner, Turkish-American Engineer Fatih Ozmen, established a private corporation named Özjet Havacilik Teknolojileri A.S. at Technopark of Bilkent University, Ankara and signed a Memorandum of understanding with the Turkish Ministry of Transport, Maritime Affairs & Communications in order to manufacture the 328 at Ankara. On 25 March 2007, Excellent Air' Dornier 328-110 D-CTOB was seen at Groningen Airport Eelde, the Netherlands. Excellent Air was founded in 1994 as a successor of Grenzland Air Services and was based at Stadtlohn Airport in Germany. Excellent Air operated a Beech Super King Air, a number of Cessna Citation Jet aircraft and three Dornier 328s for up to 32 passengers. In summer 2007, Excellent Air moved its operating base to FMO-Münster-Osnabrück. Excellent Air had to end its activities due to financial problems in September 2007. The three Dornier 328s went to Cirrus Airlines. 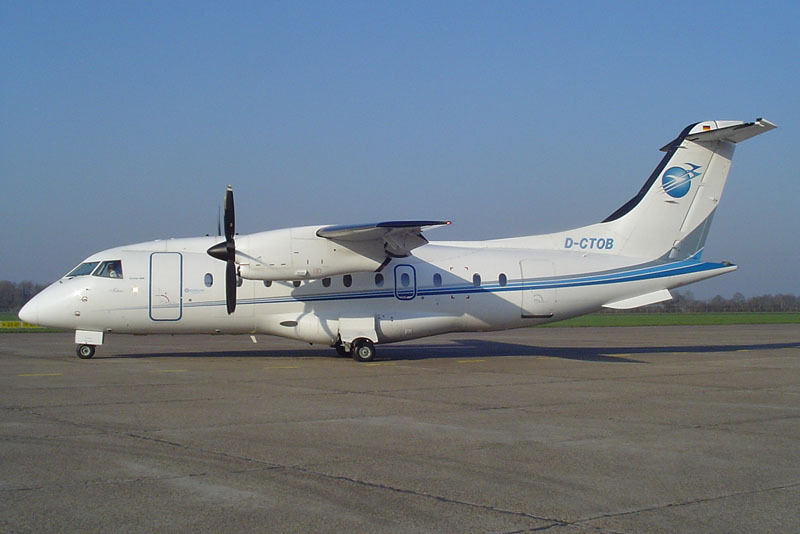 The 1999-built Dornier 328-110 c/n 3107 was test flown with Dornier Luftfahrt GmbH as D-CDXD. In August 1999, the aircraft entered service with Gandalf Airlines as I-GANL. On 21 September 1999, the Dornier 328-110 was re-registered D-CGADP and remained in service with the Italian Gandalf Airlines. In 2003, Gandalf Airlines ran into financial problems and on 20 February 2004 the Gandalf Airlines stopped flying. In March 2004, the Dornier 328-110 was registered OE-LKH in Austria with Air Alps Aviation. On 29 April 2005, the aircraft was registered D-CTOB and entered service with Excellent Air. Excellent Air had to end its activities due to financial problems in September 2007. Their three Dornier 328s, including Dornier 328-110 D-CTOB, went to Cirrus Airlines. On 19 March 2008, Dornier 328-110 D-CTOB sustained substantial damage when it overran the runway on landing at Mannheim Airport (MHG), Germany, and hit an earthen wall. Registration D-CTOB was cancelled on 7 February 2011.